[Note: I am reposting this article from the archives because of this paragraph. 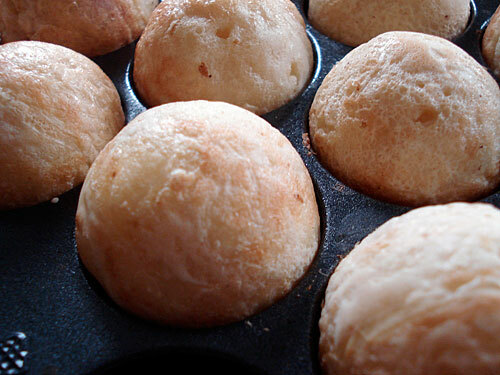 Several people have said in the comments that a Danish Æbleskiver or ebleskiver pan would be a good substitute for a takoyaki pan. You also see this mentioned on other sites. I finally got a chance to hold a real ebleskiver pan in my hands, and the bad news is that I am not sure it really would make a good substitute. The pan makes round cakes shaped similarly to takoyaki, for sure, but they are maybe 5 to 6 times the size of a takoyaki. So what you'd end up with are huge dumplings, which would need to be cooked a lot longer than takoyaki do. One of the main features of a takoyaki is the contrast between the slightly crispy outside which gradually softens under the sauce, and the just-cooked, piping hot creamy interior. I really don't think you can get that with a huge er, ball. But if you have tried it for yourself, please let me know. Another note: The video I mention below that was so great has been withdrawn due to copyright violation from YouTube. I'll replace it with more complete instructions as soon as I can, but in the meantime you can still make takoyaki from the recipe. Takoyaki is the small, round cousin of okonomiyaki, and like okonomiyaki it originated in Osaka. It's basically a flavored batter with a tiny piece of octopus (tako) inside, and is a quintessential street food snack. Since my family is from the Tokyo-Saitama area (the Kanto area), this puts me at a bit of a disadvantage when it comes to making takoyaki. Sure I've had it dozens of times, but I can't say I have had the chance of seeing it made really up close. With okonomiyaki, my ex-brother in law was from Osaka and we got to enjoy his okonomiyaki making prowess, which was one of his few redeeming features, quite a lot. But his tabletop cooking skills did not extend to takoyaki. I do have some books and so on dedicated to the subject. But I didn't really 'get' how to make takoyaki until I stumbled upon a terrific how-to video. It's far better than anything I can come up with myself, so I would simply like to transcribe and translate it for your benefit, with my notes. The recipe and method described turn out terrific takoyaki - piping hot, slightly crispy on the outside, creamy on the inside. Takoyaki maker or takoyaki plate? Takoyaki making is quite time consuming, and the little balls are best eaten while piping hot, so I recommend a tabletop model over a takoyaki plate you put on the stovetop. Also note that if you have an electric, ceramic top or induction range (as I do), a regular takoyaki plate will not function properly since there won't be enough contact surface. My takoyaki maker is a fairly inexpensive single-purpose electric model. You can also get fancier models with interchangeable plates for grilling, teppanyaki, etc besides the takoyaki plate. It's generally not recommended to use takoyaki plates on a tabletop gas cooker by the way, because the plate can trap heat underneath and potentially damage the cooker surface. So if you do get a takoyaki plate, just use it on your stovetop. A brush or a wad of cotton wool or paper towel to oil the takoyaki plate. You can get a dedicated takoyaki brush, but I just use a makeshift paper towel 'brush'. A wooden skewer or two to flip the takoyaki. Never use metal skewers, which can damage the surface of the plate. Cocktail sticks are not good either since your hand will be too close to the hot surface of the griddle. A small ladle to pour the batter. So, here is the video that teaches you all! It's a segment from an NHK program called _Takmeshite gatten_ （ためしてガッテン）, which sort of means "Try it out and be convinced", a show that tries out various theories and methods (not just related to cooking) and sees what the best way is. Anyway, watch the video all the way through first. The title of the segment is "Make pro quality takoyaki at home!" This batter is really easy to make, and yields great takoyaki! No fiddling about with grated nagaimo or anything, and no need to buy special okonomiyaki flour. They say it's for 4 people. I've found makes about 60 balls in total (allowing for some mistakes). My adjustments: I made dashi stock using the cold water method instead of using the dashi stock granules, and increased the salt to 5 grams to compensate. The dashi was ice cold from being in the fridge anyway, so I just put in a few ice cubes. The water/dashi is ice cold to prevent the gluten in the flour from developping. If you are using dashi granules, you can just use a teaspoon of one type (such as Hondashi (which is a brand name by the way)). To make the batter: Beat the eggs, and mix together with the ice water and dashi stock granules (or ice cold dashi) and soy sauce. Add the flour, and mix together lightly. Don't worry about getting all the lumps out - it's best not to overmix the batter. So easy! You just need a small amount of boiled octopus legs. It should ideally be cut up so each piece gets a bit of the suckers, for texture. Now, call me blasphemous, but I do not think you necessarily need octopus to make takoyaki. You just need a little bit of something to provide a change in texture. I have used things like cut up chikuwa, squid legs, or (gasp, horror) wieners instead of the octopus. (My experimentation in this area came about when the fishmonger refused to sell me a single octopus leg, and I didn't want to deal with a whole ugly octopus.) Whatever you use, just have it cut up into little squares and ready to go. You need some flavorless cooking oil to oil the takoyaki pan. I use peanut oil. Heat up the pan before starting. As soon as the batter is poured, drop in the octopus bits, one per compartment. When the outsides are sort of dried out, cut through the connected bits (where the batter ran out) and turn them over about 90 degrees with the wooden skewer. If you turn them too early the takoyaki will collapse and turn into a sad, ragged lump of goo. It takes a bit of practice to gauge when to turn the balls over, but you soon get the hang of it. Turn the balls over all the way. Keep flipping then round and round with the skewer. The takoyaki are done with they feel lighter when you poke and turn them with the skewer, and are lightly browned a a bit crispy on the outside. The key is for the takoyaki to be hollow on the inside. This allows the insides to steam, which cooks them nicely while retaining a creamy texture. It only takes them a minute or so to make the takoyaki in the video, but it is edited down. I find it takes about 7-8 minutes per batch. Your results may vary. Serve immediately with chopsticks or cocktail sticks, and dipping sauces. Nihai-zu: 150ml (about 2/3 cup) dashi stock, 1 Tbs. soy sauce, 2 tsp. vinegar. This is my favorite - the slight sourness with the saltiness is very refreshing. Osumashi (clear soup): 500ml (a bit more than 2 cups) dashi stock, 1/2 tsp. salt, 1 tsp. soy sauce. This is good if it's ice cold, to counteract the piping hot takoyaki. You could also try: regular American 'steak sauce' mixed with a bit of mayonnaise; oyster sauce; sweet chili sauce; barbeque sauce; even olive oil mixed with salt. Experiment! Once you have had freshly made, hot off the griddle takoyaki, you will never buy those frozen dough balls again. Cold takoyaki can be reheated, but really - they are so much superior freshly made, that I never bother to make extra. Submitted by maki on 2012-07-26 07:55. I'm such an American - I want to try this and make it sweet. They look great! I also have to worry about egg allergies so maybe an egg substitute - I'm keen to experiment! Thanks os much for all the details!! I think wieners in this would be delish. I too have a reaction to egg proteins..and i also made takoyaki once. Use some besan/gramflour or also called chickpea flour. You can get it in the asian section of the supermarket and it has much more flavour than regular flour. I use half besan and half wheat flour with a little baking powder. Also mushroom slices are great instead of octopus. Try to use rehydrated shitake..and use the liquid from the mushrooms to make the soup stock. If you want them sweet, then try the danish specialty "Aebleskiver". Search in Wikipedia or google for recipies. 3 to 4 tablespoons melted margarine? 1. Mix the flour, baking powder, salt, and nutmeg. Set aside. 2. In a mixing bowl, beat oil with sugar, then beat in egg. 3. Add flour mixture and milk alternately, beating well after each addition. 4. Spoon batter into oiled ‘appam patra pan’, filling each just below the top level. Heat the pan on a slow flame, covered with a domed lid, for 5 to 7 minutes. 6. Continue heating on a slow flame for approximately 5 minutes, or until the underside is lightly brown. Ah, they have the pans at Japan Centre! I love that place. I love reading your blog and all these great recipes for making Japanese cuisine. I have a takoyaki plate (it's originally for Pancake balls) but haven't had much success making takoyaki. I look forward to trying it with your tips. Maybe then we can buy a Takoyaki maker. Thanks for sharing! That takoyaki looks really good! I have been wanting to try takoyaki for a while. I have found octopus for fairly cheap at my local oriental market. around $5-$6 for a (roughly) 2 pound bag. Thats not much considering how often it is used in my house. i have also seen the tv advertisements for a pan called "pancake puffs" that looks a lot like takoyaki pans - this is what i was thinking of when i saw the commercial. however, the indentations on this pan do not look as round as the ones in the takoyaki pan. 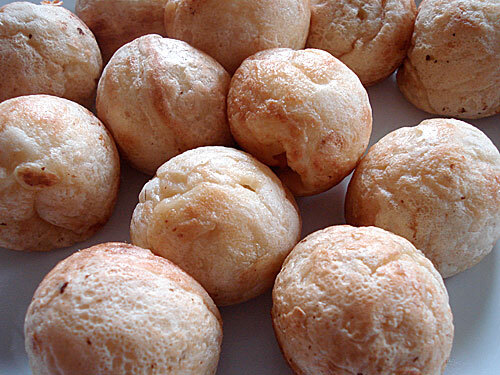 I think the 'pancake puffs' are a Danish treat called aebleskiver or ebelskiver - there is even a whole website dedicated to them (link). I keep meaning to try making them in the takoyaki pan - once I do I'll post about it here for sure. A Poffertjes pan should actually be a VERY good substitute, since the size is pretty much the same as takoyaki, but it'll have to be deep enough. The one my mother uses for Poffertjes is too flat, so the Poffertjes end up really flat. I tried making takoyaki with that one, but I ended up with mini-pancakes that had pieces of Octopus sticking out of them. I've seen deeper pans, though. I have been looking for a takoyaki pan for a long long time, my sister found one at her local Target, but it sold out very quickly before I got the chance to buy one. Finally at my local supermarket, there it was, but it was marketed as a poffertjes pan or dutch pancake (my sister's were also marketed as dutch pancake maker). 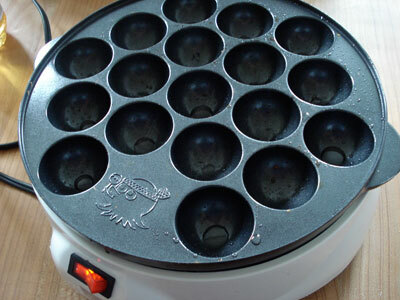 But it turns out to be not a true poffertjes pan, as there is the distinctive octopus mark on the pan (usually a good indication that it is a takoyaki pan), combined with the fact that the identations are perfect half spheres, required for takoyaki. I guess what I am trying to say is, if you ever see one on sale and if it claims to be a poffertjes pan, check it out first, sometimes they are not what they are marketed to be, you might be lucky, like me. I'm hoping to get around to writing a blog post on making takoyaki, soon. Thank you Maki for the reminder. We actually picked up a pancake puffs pan from a kitchen store in the mall near us (we were looking around for takoyaki pans). It was $10 (half what it was on TV), and we've been using it for all sorts of things. We just got a hold of some hondashi so we're going to try using this recipe with the pan and see how it turns out. The only thing with the pan, like you said, is the indentations aren't so rounded, so if you flip them completely over after the bottom sets, they tend to be a bit of a flying saucer shape rather than round. It's still a good pan for $10 but I think we might go ahead and get an electric takoyaki pan in the future if it doesn't work out too well. Anyone wondering about the pan, it's a cast iron pan with a flat bottom so it works on all cooking surfaces. Takoyaki is one of my all time favorite foods, right under sushi. The first time I had it was at a hole-in-the wall takoyaki/okonomiyaki place in the East Village of NYC. It was so small that there was standing room only, so I ordered take out like most people. They had classic takoyaki with the octopus, but also had some filled with cheese. They were both amazing. I have a cast-iron ableskiver pan, do you think I can make them in that? If you've never seen one, it's basically the same shape, but made of cast-iron and intended for stovetop or oven use, for making (duh) ableskiver. I think that an aebleskiver pan should work. I'm not sure how big the holes are on one (on a takoyaki pan they are about 1 inch in diameter) so you may or may not need to adjust the cooking time. i just use kabob sticks, they're cheap and easy to use. thanx for the recipe my boyfriend loves the ebiyaki retake on it. Your tips for making okonomiyaki were a huge help for my getting to grips with that dish. We were given a takoyaki griddle as a wedding present but it remains unused, I was too concerned about finding a trustworthy recipe. This is the one I'll be trying! Well, the video has been taken down - just thought would let you know :) Your instructions are nice enough by themselves. You can look for the ingredients at a Japanese grocery store...there are Japanese stores in Jakarta in any case (look for names like JASCO and Isetan). If you can't get a hold of okonomiyaki sauce, you can use a steak sauce instead. looking for takoyaki hot plates. any company sells on line and mail to malaysia? I'm not exactly sure how to purchase squid/octopus legs. I remember seeing octopus legs at the Japanese supermarket, frozen in a pair ... but they were huge and also 22 USD. You only need a tiny bit really, so look for boiled octopus in the sushi/sashimi section of a Japanese grocery store. Help please! I followed your recipe and practiced the turning. However, they all came out with holes. Can you tell me how to avoid opening holes? And why they all went deflated. Many thanks. By the way, love your site. Cheers. You need to turn them halfway while the batter is still wet on top, so the batter pours into the indent. Then, you turn them again (totally upside down) before the batter sets again. You can put in additional batter if it's all cooking too fast. If it develops a hole, pour some into an empty compartment, and plop the takoyaki in there hole side down and continue cooking it. As for the deflation problem...well it sort of sounds like you may need a bit more batter in each compartment (with the hole and everything).Don't be afraid of some overflow form the compartments. hi, i've fallen in love with takoyaki since the first time i ate them. i tried looking for the recipe and many thanks to u, i found it. just wondering... what is exactly the kombu and katsuo dashi? if i can't find them, is there anything else that i can use as the substitute? Dashi is the name for Japanese stock (search the site for more about it w/recipes) - and the granules are just instant versions. You can substitute any kind of vegetable stock. Hi, thankyou so much for posting this recipe, I love the look of it! I've been trying to find a recipe for takoyaki since trying some a few years back. The only thing is, I'm vegetarian, and the ones I had were filled with shiitake mushrooms. You can use a vegetarian dashi (look up 'vegan dashi' with the Search here) and soaked and cut up shiitake mushrooms instead of the tako (octopus) bits. And Japan Centre sells a stovetop takoyaki pan. I will try to make it. Thanks a lot. I just went to the grocery store to check out the "Bulldog Sauce" and there seem to be several varieties. Any idea which on I should buy? I didn't see one specifically labeled 'onokomiyaki' or 'takoyaki'. Use either Tonkatsu or Chuunou sauce from the Bulldog range. They can both also be used for other things. The best takoyaki I ever had was from a little vendor in Omiya-ku, part of Saitama-shi. Nothing I had in Osaka held a candle to that takoyaki. I have a takoyaki machine, but I haven't used it yet. I bought it when I lived in Japan, and at that time, I didn't think of getting a transformer. Anyone here, Maki, have a good one they can recommend? Thanks! My friend came back from Japan recently and taught me how to make takoyaki last night. He brought a few packages of takoyaki batter from Japan so I wasn't sure what the ingredients were. Now I do, thanks to your blog. I'm going to have to try this on my own very soon, well as soon as I get myself a takoyaki pan. Rennie (what a great blog name you have btw!) if the recipe is too much work you can buy takoyaki mix at Japanese grocery stores in the States too. Just so you know! I live in Thailand is it posible to bay it from here? I can't deny it! I love takoyaki, but I also love sweets! And I adore chocolate (who doesn't?). Hm, like chocolate-yaki! Well, maybe shokora-yaki? (Sorry, I won't make up names anymore...) Could I just replace the octopus with tiny pieces of chocolate without ruining it horribly? I know it's a late comment but I am happy you included we don't need octopus to make it. To be honest, the first time I had takoyaki I screamed because I saw octopus leg. So thank you for the batter recipe! Ya know the pancake puff pan works really well! I have a 50/60 hertz takoyaki maker that is 650W. please tell me how to use it in Australia. I bought this item from Japan. I have a converter. But do i still need to convert the watts? I really want to use this device please help me out. By 'converter' I suppose you mean a plug converter. To use a Japanese appliance in Australia (not all, but definitely with a heat-emitting appliance like a takoyaki maker) you will also need a voltage transformer. Try googling for "100v to 240v transformer" with search results limited to Australian sites. For Americans, Canadians (etc), there's something that may work, but it appears to have larger "scoops in it. I saw it on an infomercial, it's called the Pancake Puff, I'd link it but the spam filter thinks I'm spamming when I'm not in anyway associated with the company or whatnot. Still, a quick search in any search engine should turn it up quick enough. It also has recipes fo a variety of adjustments, including a chocolate version right on the website. I haven't ordered or tried it yet, but I plan to. I saw this at japanese drama and anime. (im a big fan on japanese anime).it look super delicious..ill try making it one day..
other than squid or octopus.. wat else can we use to substitute those? yummy..
and what is kombu dashi stock granules? please explain. thanks! I'm assuming of course that you got your takoyaki pan in Japan. I've been searching high and low on the internet for an electric one that will work in Europe without a ginormous transformer which would possibly cost more than the pan itself... I've not been successful and was wondering if you have any suggestions as to where I can get one? I have an aebleskiver pan (the only pan that has little ball-shaped holes i found at Solvang, California, since I live much more southern of that *cries*) but I read some comments that it might work. *Check off! The only problem I have with it is that my area does not sell a lot of dashi stocks (Vietnamese and American markets in my area that don't sell a lot of Japanese-made ingredients). I found Hondashi but I don't know exactly what to do with it because i think the instructions are in Japanese (i'm not Japanese, i'm sorry!). Is it a good idea to skip the dashi part for the batter? Or just to be sure if I read correctly, but I can use only Hondashi, which is the only available dashi I can find, right? Thanks in advance! Sorry if this is a bother because I tried making Katsudon and I do not know an another Japanese person to judge how it tastes like it should be... which is scary. And I was really thrilled to learn how to enjoy different cultural foods, so excuse my worrisome comment. haha. Just use 1 tsp. of Hon Dashi instead of the combination of two dashi powders suggested in the recipe. I used to live in Norway, and a Danish friend there would make aebleskiver in a cast iron pan - I just found a small LODGE (brand) cast iron aebleskiver pan and I'm going to try your recipe right away. In any case my Danish friend always used a knitting needle to turn the little dumplings - she said that is what her grandmother always used, and it seemed to work really well. Here's to seat-of-the-pants cooking techniques! One of these days I hope to make this with a Louisiana twist (Where I am from). Bits of crab or shrimp instead of tako, remoulade sauce to dip in. Oh man, I'm from LA too and I bet crawfish would be excellent. They aren't overpowering in flavor but have a nice firm texture, much like boiled Tako. Crawfish-yaki here I come! Thank you very much again for the info! I recently saw a donut hole and cake pop maker while shopping, would that make a good substitute for a takoyaki maker? They're a little difficult to find without ordering online. My other options would be minimuffin pans or tinfoil. I actually just used a donut hole maker to make my takoyaki, and it worked out pretty well! katsuo dashi stock granules are. can they be found on local groceries? I made a video for all to see! I think that the key to making them big and round is to not flip them all the way round. This allows the inside liquid part to flow into the mold making a shell so that when you do eventually flip it 180, it has a shell strong enough to keep it round. Hello! I love takoyaki, too! Next time I may take a photo if I remember! There is so much more to takoyaki than just the octopus...we add bits cheese, ginger(beni shoga), dried shrimp, kimchee, and even pieces of hotdog. The size of the ball doesn't matter as long as you can get the inside to set before the outside gets too burnt. There are a few places that sell ones the size of a racketball. So I am sure with a bit of practice, an Abelskiver pan would work out fine. The trick is to make sure the pan is well oiled. One of our favorite takoyaki places in and around Tokyo uses lots of oil to make the outsides very brown and crispy. My advice is to experiment with whatever sounds good. This is really fun to make with the entire family. Pour in the batter and let everyone add the various ingredients. For a laugh, booby trap one with wasabi or umeboshi. Have fun. Full of regrets of not having been able to see the video when it was time. I really like the way you describe takoyaki, it is so true ! I was going to ask about the Aebleskiver pan and then I saw that all these people had the same idea before me.. hahaha.. awesome! I'm going to try these using our OLLDDDDD cast iron aebleskiver pan. They look delicious! I trust that this finds you in good spirits. I am sorry the video you liked was taken down. I did find several other takoyaki videos on YouTube; the one by "Cooking with Dog" is quite fun and informative. I do like the Cooking with Dog takoyaki video. I hate tako, so I look forward to playing around with additives. Funnily enough, my whitey boyfriend LOVES takoyaki more than anything, and he teases me that its one Japanese food he likes that I think is gross. I've been worried as you had not posted for so long - I really hope you are ok, and doing better, and that the worst of things are behind you. Just sending you a quick hello, and a cyberspace hug. They look wonderful! Can I replace the dashi stock granules with some fish stock powder or so? They are hard to come by over here. Western fish stock is not a good substitute for Japanese dashi. It has a very different flavor profile. Have you seen this thing??? It's got a motor that gradually turns the takoyaki so you don't have to fiddle with it. LOL! What next? My godmother was Danish and made ebelskiver, and to watch her it looked so easy. I guess it just takes lots of practice. Having just come back from Japan, and having had takoyaki as I was in Osaka a few days (very nice), I think that the size of the little balls is closer to what you get with a Dutch "poffertjes" pan, as they are more or less the same size. Although the holes are a perhaps a bit shallower in the Dutch version. The timing probably did take longer... I can't remember. (It's been a while.) My main complaint was that I couldn't cook as many at one time, so I spent a lot of time in the kitchen and most got eaten while I finished cooking! As you say, takoyaki are best right when cooked. By the way, there are lots of videos on youtube on how to make these, and it was a great help in figuring out the technique. I saw this kind of plate used a lot in China(Si Chuan). Chinese use it for "eggs sausage", very delicious food. ps: your blog is amazing! There are a few takoyaki street stalls appearing in London recently and it would be good if they offered these simpler versions with ponzu or this nice nihai-zu. This is one of my favorites! I call them tiny edible balls of Japanese heaven. :) Thank you for sharing your recipe, especially the batter for takoyaki. I wonder if you could use those "cake pop" pans that seem to be all the rage now in the U.S, they are small and ball shaped. Target and Wall-Mart sell them for under $20. Just an idea. Would think to try them but not a fan of octopus, love how they look on T.V with the sauce and it looked like green onion, very colorful. The street vendors make these by the thousand, flipping them over with military precision. A great snack and a great street food ! Re: HELP, why does my takoyaki cast iron pan sticks? Can you pls advise me as my first time usage of the cast iron sticks! I did oil it but I had such a hard time turning it over. Could it be my recipe that has gone wrong? I used 250g normal flour, 2 eggs n 800ml of chill water. Now, where did i go wrong? Please help as i cant find any stores that sells takoyaki flour mix in my country. When things stick to a new cast iron pan, it usually means that you didn't season it beforehand. Try looking up 'how to season a cast iron frying pan' for some hints. So much stuff to read! But learned much to see that this wonderful food is easy to prepare as well. What do you do to make them keeping the round & soft shape after the oven? Re: Takoyaki...could you make in electric cake pop maker? Do you think it would work to make takoyaki in cake pop maker?. Is that closer to the right size as opposed to abelskiver skillet? I just thought I'd point out that it should say 100V (volts) not 100W (watts). Big difference, and important to get right when talking about something that could be a fire hazard. Can I substitute dashi for something else? My small hometown in Alberta Canada doesn't sell dashi or anything that i can make it with and the nearest Asian store is to far for me to travel with out my car, its in the shop for a week; but i really wanted to make takoyaki so i could try it at least once. any suggestions? Approximately how large are the individual scoops in the takoyaki pan? Like depth and diameter? My freind's mom makes kanom krok (a sweet and savory thai coconut pudding snack) for me whenever she's knows I'm coming to visit. The pan she uses looks really similar and I know that I could find one in my area very easily but I'm not sure if the kanom krok pan would make them large enough. Each takoyaki is about 1 inch (2.5cm or so) in diameter, give or take a half inch or so. In the pan here they are about that size, and each one needs about 1 1/2 tablespoons of batter. I think the kanom krok pan is a little shallower but I'll try adjusting the amount of batter I put in. I'm sure they'll turn out just fine if a little smaller. Thanks! This may have already been said but I've noticed that there are a lot of "cake pop" pans and electric makers available now, I think the size would probably be ideal as a takoyaki pan substitute instead of the ebleskiver pan. Hi there, perhaps a poffertjes pan will be the tool you are looking for? Not 100% sure if this is the same as the old video as I'm currently at work and can't really watch videos, but I think it may be. Hi, I am from the Philippines, I would like to ask where can I buy the takoyaki plate as shown above, we would like to try cooking takoyaki here at home in the Philippines.